When we were listening to the take of “The St. Louis Vipers Club” on Kitchen Swing after recording it, Steve asked Cass, “sounds pretty good, huh?” Cass nodded enthusiastically and said, “yeah, nobody play like that no more.” True, to a point, but nobody ever has or ever will play anything like Elvin Jones did. Elvin was my last real hero, a player who I truly idolized. I only got to see him play once, at the Hollywood Bowl, where I gazed at him through binoculars until my arms fell asleep. He was a grinning tiger down there on the stage, looking so natural and fluid that he made the rest of his Jazz Machine, all monster players less than half his age, look like they’d never performed in public before. Watching him then, I guessed he had a good ten or twenty years. A lot of jazzers can tell you who’s on a record just by listening. I’ve never been any good at that. There are three or four musicians I can recognize: Monk, Harry Connick (because it sounds like a new recording of Monk), and Elvin. Maybe John Coltrane. A lot of people think Led Zeppelin drummer John Bonham invented the broken triplet (triplets played between three drums — y’know, “boogita boogita boogita”), but Elvin played them first. And up until the day he died, nobody played them with more style and swing. What Elvin played couldn’t be notated! There simply just isn’t a way to write down the way he kept time. My friend Joe Adamik, drummer for Califone, likes to argue with me about Elvin’s technique. I think he wouldn’t be able to play corp level rudiments, at least not the satisfaction of any corp leader (provided they didn’t know it was him). I don’t know, maybe he could, but years and years ago I felt I had to make a decision: I could either take the path to mastery of technique or of swing, and it was listening to Elvin that made the choice easy for me. Groove, feel, swing, call it what you will, but that elusive element of music is what moves people, literally as well as emotionally. Although Elvin’s work with ‘Trane is considered avante garde, it still stands up as some of the very rare material in that style that has an undeniable accessibility, even a spirituality. If I could ever be a part of something even half as great as any project Elvin worked on, I’d consider my life’s work complete. If you can find it, check out the record he did with the group Oregon. Elvin and tabla — now THAT’S a cool record. Naturally, the man was full of humility and humor, which made him a role model for any serious artist. Pianist Keith Jarrett once said that the most important thing artists can do is question the purity of their desire to create. 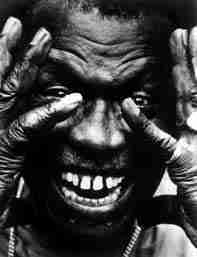 Listen to two measures of Elvin Jones expressing himself through the drum kit, and you’ll hear that his is truly a pure musical soul.